Icy Dock presents the DuoSwap MB971SP-B, a 5.25" hot swap drive caddy for 2.5" and 3.5" SATA HDD and SSD storage devices. External docking stations are popular because of its flexibility and compatibility. However, because it is for external use, the interface limits the transfer speed of your hard drive while only allowing one to be use at a time. In a standard computer case, there are several 5.25" bays usually reserved for your DVD ROM drive, however, will not naturally fit with your 2.5" or 3.5" hard drives without some assistance. Using the MB971SP-B DuoSwap, you will save precious desktop space by integrating both 3.5" & 2.5" slots into a single 5.25" bay. This gives you the ability to expand and easily go from your external docking station to your computer in just seconds. Some key features that help make using the device simple to use are: Individual LED's, power button & eject button. Because the hard drives are connected internally, you will be able to transfer your files up to SATA 6Gb speed. You will be able to finish the job done much faster than ever before with this setup. The security of your hard drive or SSD is a non-issue as the "Eagle-Hook" mechanism switches on immediately after the 3.5" drive is inserted and locks the 3.5" hard drive in place. Having an easy way to use your hard drives as they should be used, without the worry of installing or removing makes it a must have accessory for any personal PC, Lab testing PC or HDD duplication system. * Connects up to one 2.5" & 3.5" SATA HDD in one 5.25" bay for a space saving setup. * Supports a single 2.5" HDD/SSD up to 9.5mm while the 3.5" bay is in use. * Fast and simple tool-less drive installation. * 2 part anti-dust cover protects system internals even when a small 2.5" SATA drive is used. * Anti vibration kit for the 3.5" drive bay to help reduce movement. * Eagle-Hook mechanism design added extra security to the 3.5" hard drive. * Individual LED for both 2.5" & 3.5" bays. * Easy access individual power buttons allows hard drive life expendability and energy conservation. * Large individual drive eject button for hassle free drive removal. * Perfect for any technical level of computer users. 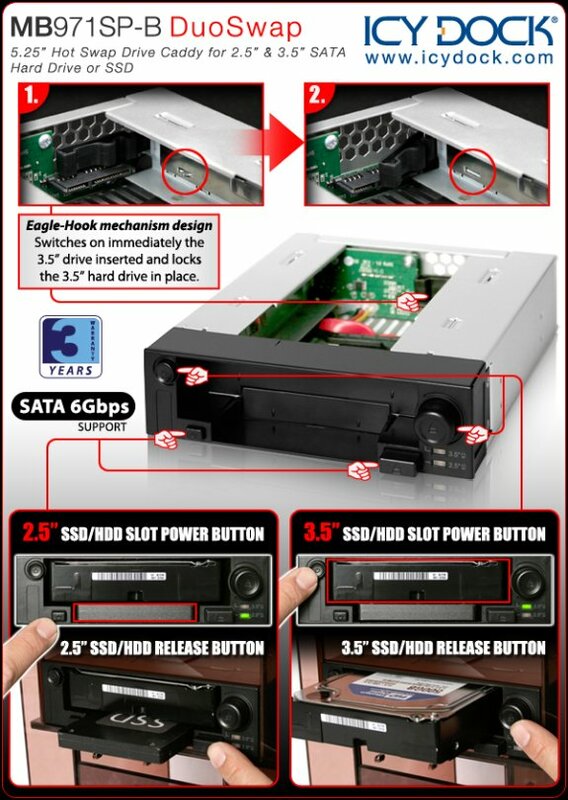 * Support SATA 3 6Gbps.